Please fill in OFF-LINE form in case you requesting a possibility of accommodation. After that you will receive an offer per e-mail. In case of your positive answer you will receive a confirmation of the reservation. In winter time you can ski directly to the hotel from the ski resort Medvedin (about 400m far away), if conditions are favorable. The skibus, which has the stop directly by the hotel, takes you comfortable to the lower station of the ski resort Medvedin and St. Peter ( located approx. 1km from the hotel). The Hotel has two hotel restaurants. 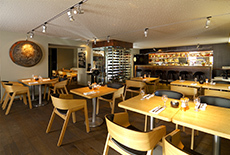 Orange le Moon offers modern cuisine and boasts two victories in Tripadvisor (2014 and 2015). The second restaurant ,, Roasted duck Inn " offers a tradicional czech homemade food. The hotel has accommodation in all categories. Standart rooms are in 50m away depandancy ( pension ,, Roasted duck Inn", Comfort rooms and Deluxe rooms are located in the main building. 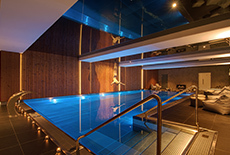 For guests of De Luxe rooms is the entry to the wellnes&spa throughout the stay for free. 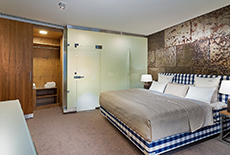 superiorly equipped rooms with Hästens beds, private bathroom and WC, Smart TV - SAT, Wi-fi, minibar, safe. 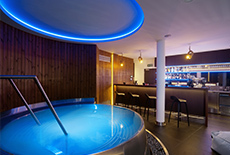 For guests of De Luxe rooms is the entry to the wellnes&spa throughout the stay for free. Two-room apartments have 48 sq.m with a hallway, a built in wardrobe, two toilets and a bathroom. In the bathroom is a shower, which has a shower head with a rainfall effect, a bidet, the toilet and luxury cosmetics Four Elements, a dressing-gown and slippers. The living room has a sofa bed with two full-beds for two persons and a bedroom with an own entrance to the bathroom. Both rooms are separated by a door, and each has own SMART TV. The room has a private balcony overlooking the panorama of Giant mountains. Double rooms have 22 sq.m with a hallway, a built in wardrobe, a toilet and a bathroom. In the bathroom is a shower, which has a shower head with a rainfall effect, the toilet and luxury cosmetics Four Elements, a dressing-gown and slippers. 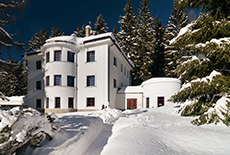 The room has an extra bed for one person.The private balcony overlooking the panorama of Giant mountains.